other small businesses. Michelle and her family are fairly new to Ellis County, having relocated from Southeast Texas, where she successfully ran her wedding and event business for five years before moving to the Dallas area in order to challenge herself in a larger market. She promotes “shop small” on all her social media outlets and, since relaunching in Ellis County, has featured several venues owned by locals during her LIVE Venue Tour segment on FB and Instagram. Before her move to Ellis County, Michelle was featured in VIP of Southeast Texas Magazine three times and was instrumental in bringing the Lupus Walk to Beaumont. She also worked with Marcus Luttrell and the Lone Survivor Foundation on the groundbreaking of their Crystal Beach facility for veterans. State Farm agents) in all of the United States. Adam has a heart of gold and is always determined to give back in as many ways as possible through volunteering at The Avenue Church, Common Grounds Ministry and the WISD. Adam is a well-respected colleague and friend among his peers. 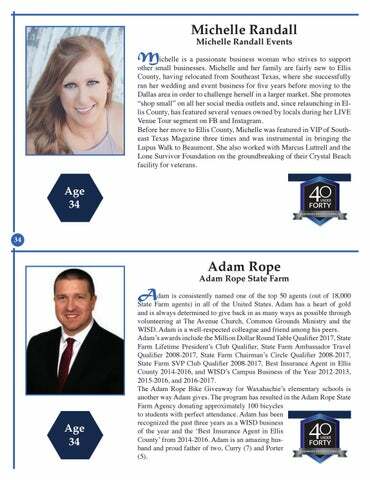 Adam’s awards include the Million Dollar Round Table Qualifier 2017, State Farm Lifetime President’s Club Qualifier, State Farm Ambassador Travel Qualifier 2008-2017, State Farm Chairman’s Circle Qualifier 2008-2017, State Farm SVP Club Qualifier 2008-2017, Best Insurance Agent in Ellis County 2014-2016, and WISD’s Campus Business of the Year 2012-2013, 2015-2016, and 2016-2017. The Adam Rope Bike Giveaway for Waxahachie’s elementary schools is another way Adam gives. The program has resulted in the Adam Rope State Farm Agency donating approximately 100 bicycles to students with perfect attendance. Adam has been recognized the past three years as a WISD business of the year and the ‘Best Insurance Agent in Ellis County’ from 2014-2016. Adam is an amazing husband and proud father of two, Curry (7) and Porter (5).